One project leads to another! At this point in my DIY adventures, that phrase is the leading contender to go on my tombstone. HA! When I gave my son’s bookrack a makeover, I took the opportunity to move the bookrack to a different wall. It just made more sense for how the space was being utilized. That freed up the wall where the bookrack used to reside for some art. I decided to use the space to create a gallery wall with a car theme. It’s perfect for a boy’s bedroom. I believe this bedoom was an attic conversion, so the ceiling angles have a lot of…what’s the word I’m looking for? Interesting challenges. Places to hit your head. Character. Yes, character. You can never have too much of that. Or can you? 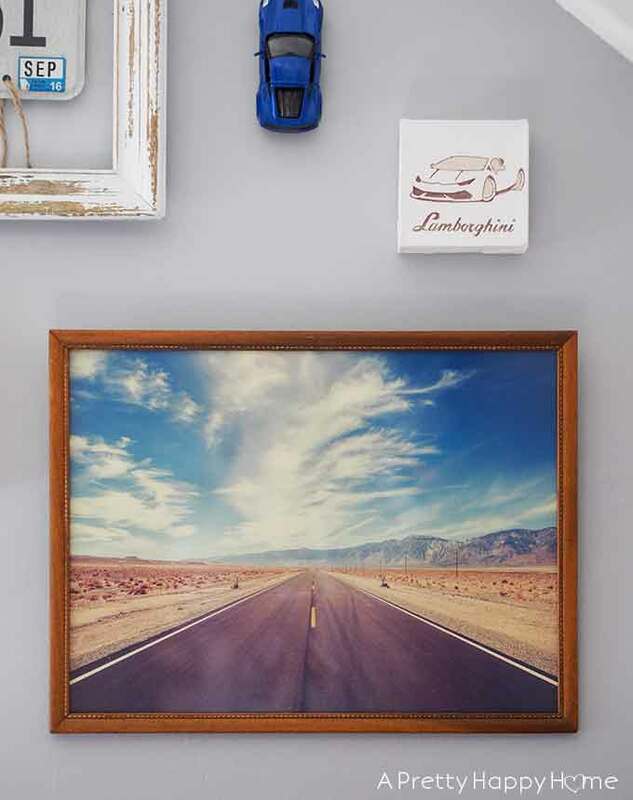 The gallery wall was inspired by a vintage-looking photo of a road I found at the thrift store for $3. I bought the art solely for the photo. The frame was in such rough shape that the cashier gave me a 10% discount off of the $3, which paid for the sales tax. However, a tap of the hammer and a little wood glue secured the corners of the frame. Miraculously. After I cleaned the frame and applied some Howard Feed-N-Wax to condition the wood, I decided the frame was worth keeping. It lends itself well to that ‘collected over time’ look that I love. Do you know what else I have legitimately collected over time? We’ve moved so often that we have license plates from at least 3 states. I’m not sure why, but I can’t seem to let go of the license plates. Does anyone else hang onto their old license plates? I hung one of the plates from Georgia (the place my son asks to move back to weekly) with some twine stapled to the inside of a frame that didn’t have any glass. That hack worked out better than I thought it would. Continuing with the license plate theme, we have another license plate, or rather, a fragment of a license plate, from Ireland. 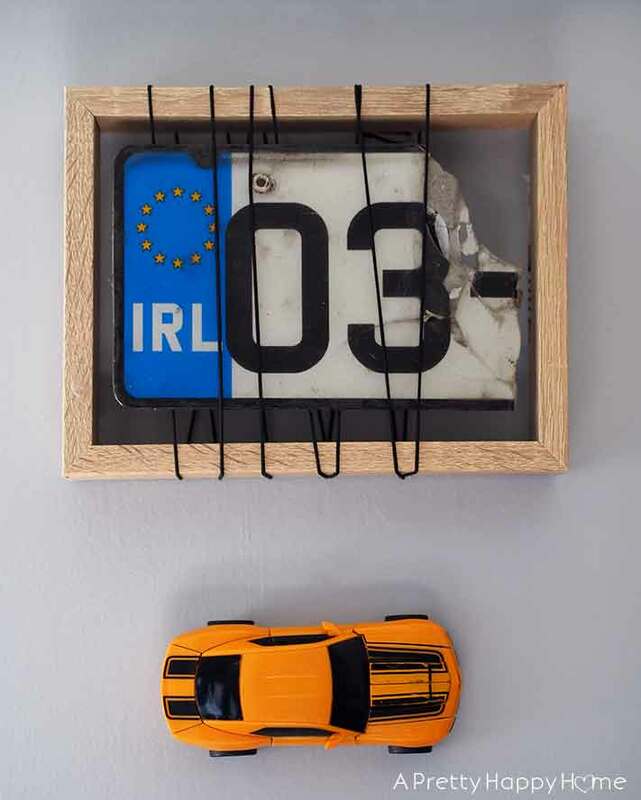 This fragment is pretty special because people don’t change license plates in Ireland like they do in the U.S. In Europe your car is licensed to the country, not a smaller section of the country like here. So to find an actual license plate is really hard. This license plate fragment was lying in the middle of the road. We spotted it on our way home from school one day. (We lived in Ireland for 2 years.) Since finding things on the side of the road and turning them into art is one of my favorite hobbies, that’s what I did. I’ve been trying to figure out how to frame this license plate for over a YEAR now. It was my recent wrapped string art project for my daughter’s room that made the below frame from Michael’s catch my eye. The elastic string wrapped around the frame is just strong enough to hold the license plate in place. There was a big stack of these frames on clearance, which tells me it wasn’t a very popular style. Oddly enough, I’m okay with that because it solved a problem and I didn’t have a frame at home that would work for this particular project. The last thing I want to mention is the wood box underneath this gallery wall. It has nothing to do with cars, but it does have sentimental value. It was my toy box when I was little. I can remember leaning over into it on my tiptoes and feeling like the box was cavernous. It’s not – that’s just how young I must have been at the time. I can also remember being a preteen and hiding a pair of grey corduroy pants that my mom insisted I wear in the bottom of the box. I loathed wearing those pants with the misplaced passion that only a 12-year-old can muster. Ironically, I spent my own hard-earned money on a pair of grey corduroy pants when I was in my 20s. The toy box has a not-so-lovely orange tint and could use a makeover, but if I wait another couple of decades that orange tint will be all the rage. Right?!?! But if I only want to wait another 7 years, my son will be able to drive himself to the hardware store to get the supplies for that makeover! I think I’m going to need every second of those 7 years to prepare myself for that moment. 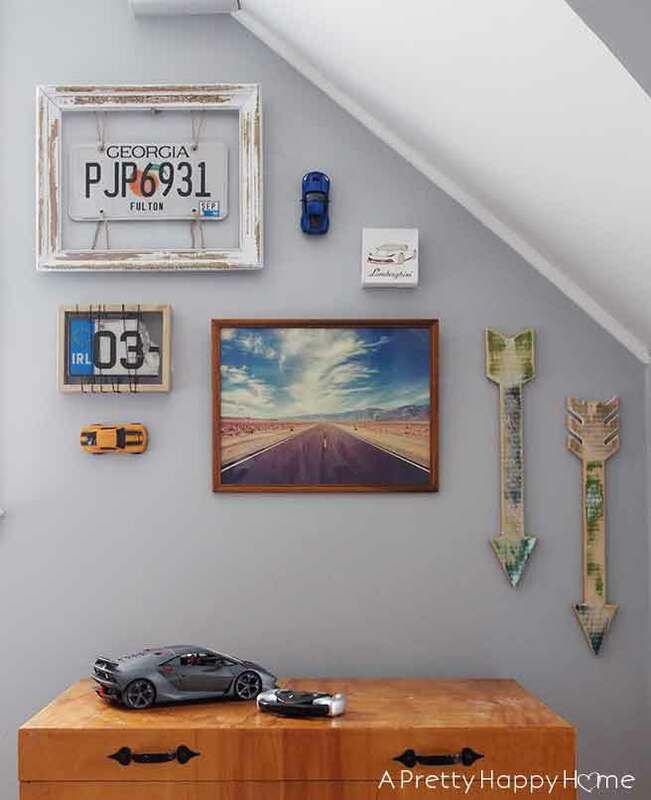 In the meantime, I’ll just be happy this gallery wall with a car theme is done. P.S. 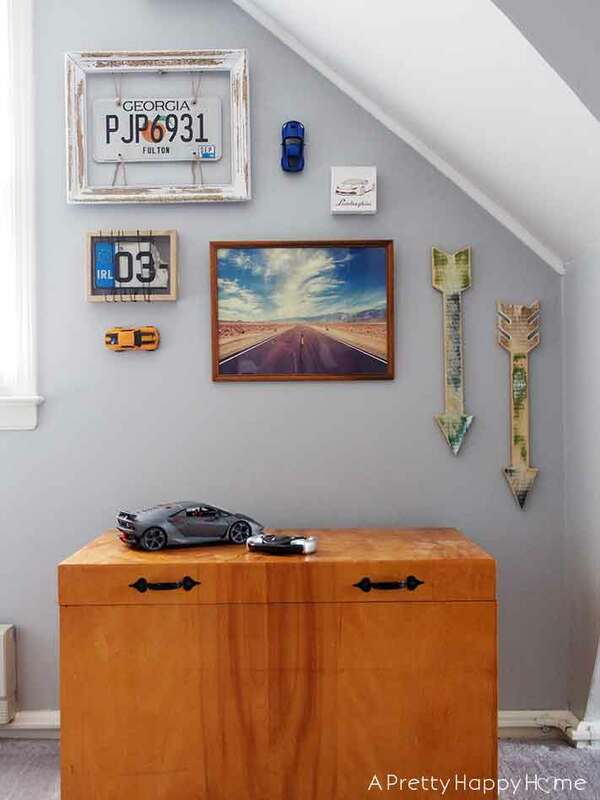 If you hang a toy car on the wall with Command Strips , you might need to use two layers of strips to make it thick enough (to get past the wheels) to stick to the wall. These particular cars weren’t heavy, so I cut one Command Strip in half to double it up. So far, so good! P.P.S. My son loves his Lamborghini Remote Control Car and plays with it every other day or so. He thinks Santa brought it to him, but it came from Amazon. The Lamborghini canvas was given to him by his uncle. P.P.S.S. 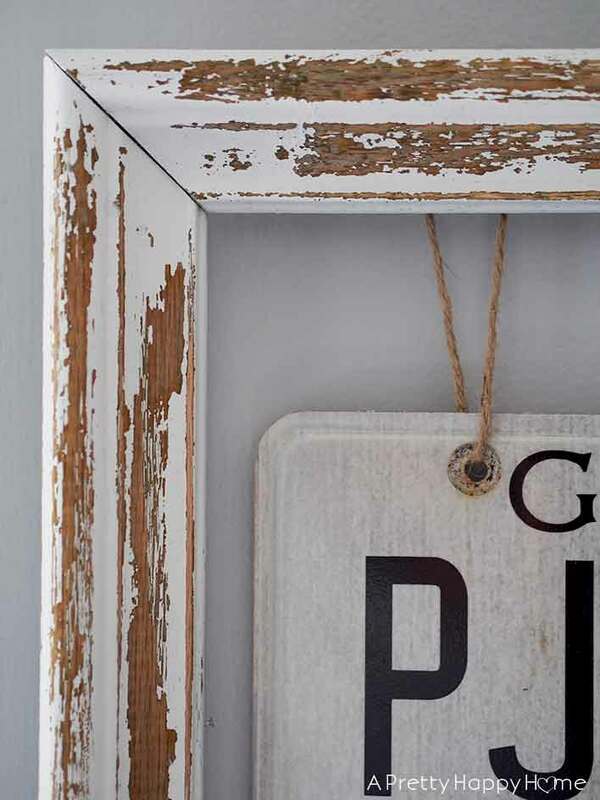 The rustic wood arrows have nothing to do with cars and were a DIY accident. Ha! They started out as arrows I painted for an old project. I intended to sand them down all the way, but I stopped at the point you see them now when I realized how great they looked only partially sanded. When I first saw the chest I thought I recognized it. I remember seeing it at your house on Bridgeport Rd. Isn’t it fun to have some fun memories of days past like the story of the corduroy pants. It looks nice in Tor’s room. I like your make overs and also the license plates. You’ll have to find one from New Jersey. You have an EXCELLENT memory!